Tripod Turnstiles is a robust, and Time-tested half height turnstile model design popular among organizations in Singapore. It has has a compact overall housing. They are often deployed as a compact access control alternative to a more extensive Full height turnstile solution in various facilities, such as Schools, Medical Facilities, Exhibition & Convention Centers, Museums, Amusement parks and Fitness facilities. More than a thousand personnel pass through turnstile gates daily in Singapore, therefore it is crucial to select a turnstile that robust and also compatible with your pedestrian access control needs. 1. Is it a standalone turnstile usage or integrated as part of the access control solutions? 2. Where on which building site do you intend to deploy the turnstile? 3. Which security access control function does it require to perform and complete? For more e information on our Tripod Turnstile products or request for quotation, simply call to contact us today at +65 61008374 for a no obligation discussion of your needs. if you have any questions or queries, our knowledgeable and a friendly consulting representative will be happy to answer any of your queries and share with you in details the benefits & features of deploying a Tripod Turnstile at your building front desk entrance. For seamless integration into a pre-existing access control solution, our standard turnstile body post comes installed with an Access controller and two authentication readers devices such as Access control proximity card reader, card capture device, audio alarm with indicator lights to for an intuitive user feedback functionality. Choosing turnstiles with pre-installed readers greatly shorten the installation time and doesn’t affect the aesthetic appearance of the office environment. The most popular variant IP-based turnstile offers a total access control solution. It consists of a turnstile with built-in controller and readers or even a card capture reader if required. This can be done out using various credentials, such as the Printed barcode, QR code, NFC proximity smart card, and even Mobile phone NFC. If space constraint is a challenge for a small sized reception, a tripod turnstile with a slimmer, shorter design form factor can be used. the elegant lean structure allows the tripod turnstile to have the versatility to discreetly fit into a wide range of operating environment. With its compact design, the tripod can be applied at entrance points of various configurations. Compact tripod turnstile features anti-panic barrier arms automatically falling down when triggered by an emergency alarm signal or during a power loss, which makes it possible to immediately clear the passageway in emergency situations. The tripod turnstile is equipped with automatic anti-panic folding arms is suitable for indoor application at entrances of commercial, public and industrial organizations providing distant clear of the passageway in case of emergency. Another consideration is ensuring compliance with regulatory safety standards imposed on passage area arrangement at facility entrance. Having the safety capability to create an instant passage clearance for the unobstructed escape during an emergency evacuation is an essential safety requirement. It is necessary to not only prevent an unauthorized person passage but also to provide the possibility of the escape route arrangement in case of an urgent building evacuation. This can be achieved in a number of various different ways, such as choosing a turnstile (eg. Speed gates or motorized Swing gates) that provides a wide passage area when the device power is switched off or has an alarm signal option. Turnstile equipped with anti-panic barrier arms configuration (automatic) or key override control function (manual) will be sufficient for the small company building facility. Automated anti-panic barrier arms fall in a vertical position when it has received an emergency alarm signal or shut off. In this way, it helps to clear the passageway without the need to use the key or tools. Once the emergency is restored, the tripod arm rearms and functions as per normal automatically. 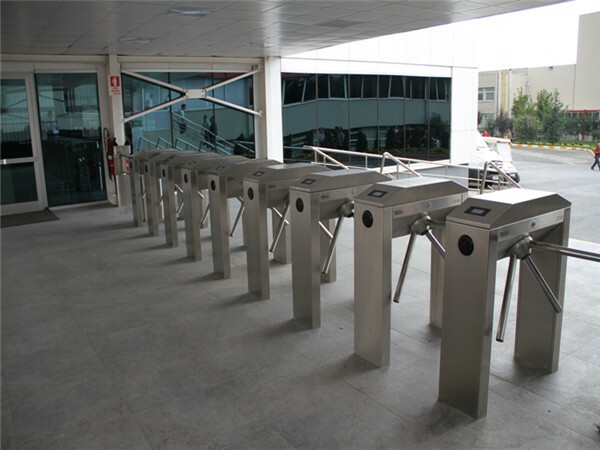 The turnstile performs emergency folding of barrier arms by a remote signal from an access control system or at a power loss. When the power is restored to bring back the folded arm into operating position (blocking the passage) just lift it manually. In most case, it’s very possible that these reception employees have to manage visitor movement through the use of identity credential authentication before being given entrance access. On the way into the guarded building, all visitor have to how their uniquely issued credentials to the digital authentication device such as RFID smart card reader or Biometrics reader (fingerprint, finger-vein, or Facial features) or PIN pad. In a Smart lane optical turnstiles setup, as the personal identity credential is successfully verified, the turnstile glass barrier will swing open to open the lanes for an unobstructed passage for the person to proceed through. Typically on the way to exit, our clients do not control personnel exit by having an unrestricted free exit arrangement.